Tighten up a tubby kick drum, remove unwanted room tone, emphasize the decay of your toms, transform guitar DI’s, add brilliance to a vocal, and so much more! The Attack parameter controls the strength of the detected transients. A high attack will increase the perceived attack of an instrument, giving the impression of a high velocity note being played. A low attack will give the opposite effect. The Sustain parameter controls the strength of the detected sustained signal post-transient. A high sustain will increase the amplitude of the sustain portion of the signal, allowing you to increase the decay of the source. A low sustain will give the opposite effect. The 2X control doubles the effect of the respective Attack and Sustain controls. Activates a clipper on the output of each respective section, which gives the output of Multi Transient a hard digital ceiling. This can be used to control the strength of the transients when the 2X switch is activated by clipping the transient if it gets too hot. For exaggerated clipped effects, push into the clipper using the Output control. Dials in the right amount of output gain using a linear output circuit. Inverts the polarity of the plugin’s output. Brings Multi Transient in and out of bypass. Blends between the completely dry signal and the output of the channel’s transient detection and shaping circuit. Allows you to find just the right overall blend of the shaped signal, or to create more subtle parallel transient shaping effects. 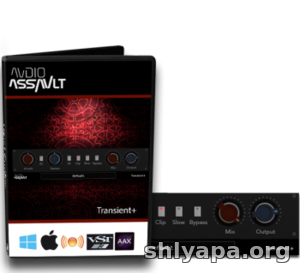 Transient+ is available in VST/VST3/RTAS/AAX and AU* on Mac & Windows in both 32 & 64 bit versions.